Courtesy of Moana Realty LLC. 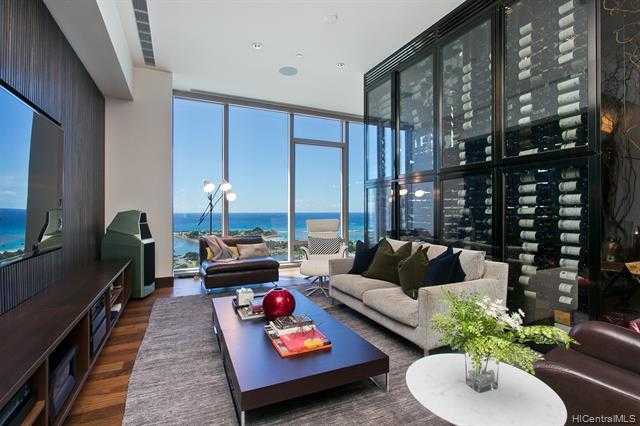 This beautifully furnished grand penthouse 3BR (2 grand master bedroom suite)+Den +Entertainment room/3.5BA/3 PKG with 1,935 sqft rooftop terrace offers breathtaking views of Ocean, Ala Moana Beach Park, Ala Wai harbor from 10 feet high ceilings & floor to ceiling glass throughout. ONE Ala Moana is ultra luxury, an elegant, refined, well designed condominium conveniently located above Ala Moana Center x2014;the world x2019;s largest open-air mall with extraordinary lifestyle and amenities beyond comparison. Beside a 210 bottle Sub-Zero wine cooler, extra wine tower to showcase and keep hundreds of precious wines. The rooftop terrace is equipped for perfect entertaining with BBQ, pizza oven or just soak in the jacuzzi under the starlight. Please, send me more information on this property: MLS# 201903421 – $9,800,000 – 1555 Kapiolani Boulevard Unit 2301, Honolulu, HI 96814.